In this study, the results of experimental tests performed on unreinforced masonry infill walls are presented. The out-of-plane response of infills different for the thickness and for the boundary conditions but equal for the construction procedure and the materials used is investigated. Infills with two different height-to-thickness slenderness ratios are tested. In addition, three different boundary conditions at edges are considered. The experimental results are used to assess, for different values of the slenderness ratio, the effectiveness of the out-of-plane strength formulations for unreinforced masonry enclosures in which the mono-directional or bi-directional arching mechanism can occur. A discussion on the different post-peak response of specimens with different boundary condition (brittle, for vertical spanning infills, non-brittle for infills mortared along three or four edges to the confining elements) is also presented. In the case of one-way arching, literature and code models underestimate the out-of-plane strength of thinner specimens and overestimate it for thicker specimens. 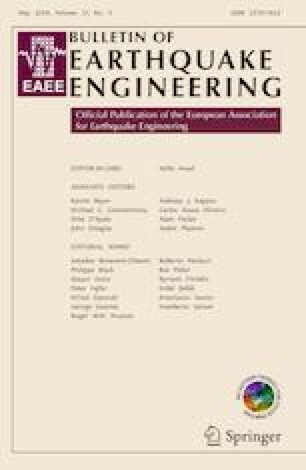 In the case of two-way arching, all the existing strength formulations are significantly conservative and potentially adequate for a code-based safety check of unreinforced masonry infill walls under out-of-plane seismic demand. METROPOLIS (Integrated and sustainable methodologies and technologies for the adaptation and safety of urban systems - PON Ricerca e Competitività 2007–2013). Italian Department of Civil Protection ReLUIS-DPC 2014–2018 Linea Cemento Armato – Work Package 6 (Grant No. E56D16000670005).